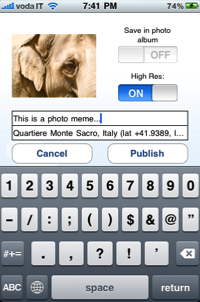 Meemi for iPhone is an application to access it with iPhoneOS devices, requires iOS version 3.1 or later and it's tested and fully compatible with iOS 4. The source of the application has been released under the MIT License and is available on GitHub. 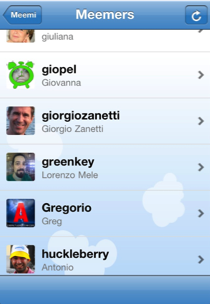 The application, when started, shows the view "with friends". That's the first 20 memes from your friends or to which your friends have interacted (preferred, reshared, etc.). the man is a view to "your personal memes", the one you answered, reshared or preferred or in which you have been mentioned (via @username tag). In this view are also the memes you explicitly mark as "to be followed" in the next screen. The left button opens the search form. 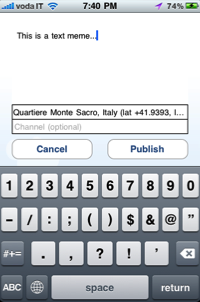 It's possible to look for sender, free text or channel. The last button opens the user list. All memes have an icon representing the type: camera for photo memes; film for video memes; a chain for link memes. Seleting a meme you will be sent to a thread detail page. marking the meme as "significant" (it will be maintained into the "men shaped" list on main screen); preferring the meme or resharing it. Keep in mind that preferring or resharing a meme is a public action, that will be visible on the web application, while marking it "significant" is a completely private action. If you select a meme you'll see its detail: for a video or photo meme, video or photo respectively; a web site for link memes.. The application will try to show you the content of the first hyperlink contained inside a text meme (if any). Remember that not all the video are compatible with your device. 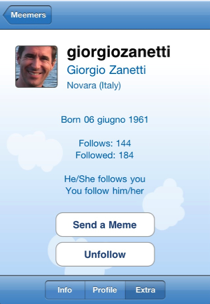 By selecting the user's avatar in a meme or into the user list, it will bring you to the selected user's details page. Here you could see detailed information about the user and its profile, selecting the corresponding button below. If you select the image, it will be reloaded full screen and refreshed into the system. For performance reasons, the image are heavily cached. Seeing an avatar full screen will refresh it into the system. Into the "extra" screen you will know: birthdate (if any); the number of users followed by him/her and following him/her; if the user follows you or it's followed by you. From this screen you can follow/unfollow the user or sent him/her a private meme selecting the buttons. In every list, the upper right button will start a new meme. If you are into the thread detail list, it will be a "reply meme". If, instead, you are into the mail list, it will be a new meme. New meme can be text or images. If the latter, the image could be taken at the moment (if the device have a camera) or loaded from the photo library of the device. Images can be loaded in "high resolution" (the native resolution of the photo) or scaled down to reduce the transfer size and time. For further informations, write me at the email address below or contact me directly on Meemi. Follow me on twitter or, better, on Meemi. I'll follow you back, because I need some pen pal.